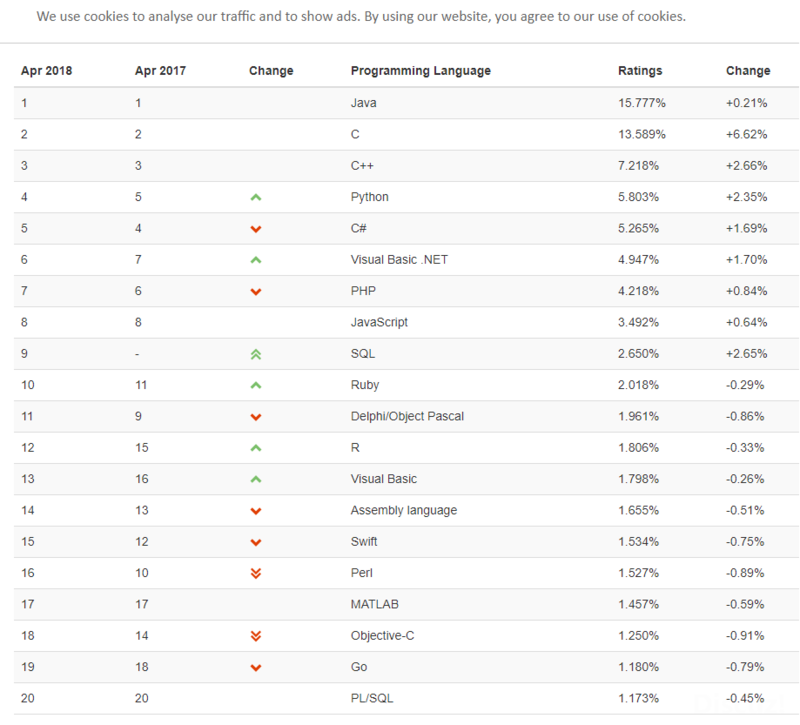 At the moment there are 2 programming languages in the top 20 that have lost more than 3 positions in 1 year's time: Objective-C and Perl. The reason for the fall of Objective-C is clear. Apple abadoned Objective-C a couple of years ago and replaced it by its successor Swift. Moreover, mobile app development is moving to platform independent languages and frameworks, so even Swift, which is only available on Apple's systems, has a hard time. But what about Perl? Till 2005 it was the most dominating scripting language in the world. In 2008 we said in an interview with Dr. Dobb's Journal that Perl would go extinct based on the trend we saw in the TIOBE index at that time. After this a religious war started with Perl diehards who claimed that this won't happen and that the TIOBE index was being gamed. Stevan Little gave a ground-breaking talk in 2013 called "Perl is not dead, it is a dead end" indicating that once software engineers leave the Perl language they will never come back. Personally I think that the fork of Perl 6 (and its delays for decades) together with the unclear future of what was going to happen to the language was the main reason for engineers to look for alternatives such as Python and Ruby. And still today the Perl community hasn't defined a clear future, and as a consequence, it is slowly fading away. IMPORTANT NOTE. SQL has been added again to the TIOBE index since February 2018. The reason for this is that SQL appears to be Turing complete. As a consequence, there is no recent history for the language and thus it might seem the SQL language is rising very fast. This is not the case.